There are times when I feel like the thanks are too much. I won’t say that there is an abundance of appreciation found in mission work, but we have never failed to receive appreciation for what we have been able to do since we came to Tanzania. People in the US have expressed gratitude for us being willing to be here and do the work and Tanzanians that we have worked with have also expressed thanks for the assistance we have been able to offer. Every once in a while though I wonder if the “thank yous” and “job well dones” always get to where they should go. This last week I was able to register one young man for his Form II national exam which he will take in October. Wikendi is 23 years old and stopped his education after 7th grade because there was no money for him to continue on. He doesn’t come from a rich family and all of the older siblings that may have been able to help him through school have passed away. Out of the original 8 children there are only 3 of them left which has made Wikendi one of the oldest instead of one of the youngest. He has been one of those that has more than once said thank you for me being able to get him into an adult education program so that he can finish secondary school and hopefully one day head on to seminary. Sometimes though I am not sure how much he should be thanking me instead of me thanking him. I have been able to get him into school and he finally has a chance at the education he has been missing for years, but the challenges are far from over. He walks an hour one way to get to the adult education program, and he is no longer a child. At home he is responsible for the economic well-being of his family. His day starts early (4-5 am) for him to finish work on the farm and around his mom’s house before he continues the work of building his own house before he has to head off to school. Between travel and class time he is gone for seven hours a day, not getting home until 7 pm just in time for it to get dark, and that does not include any of the great amount of studying that he now has to do. On top of school and home, he has taken on many of the responsibilities of the local church in Gamasara with more coming after he has passed the certification part of his ordination process. All in all, I can only hope that in the next few months he is still thankful for this opportunity. I am certainly thankful for him willing to take full advantage of this opportunity and approach it with the dedication it deserves. 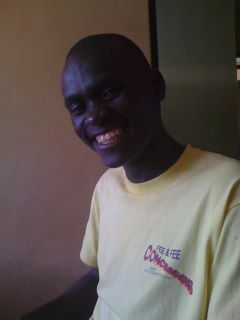 Today my thanks goes to Wikendi and the willingness he has to follow God’s call into challenging times.